Home Augmented Reality School Fab Lab AR Mobile App Available at the Apple Store! For educators and makerspace enthusiasts, the School Fab Lab AR app, a tool to help you create your new makerspace, has launched on the iOS Apple store! 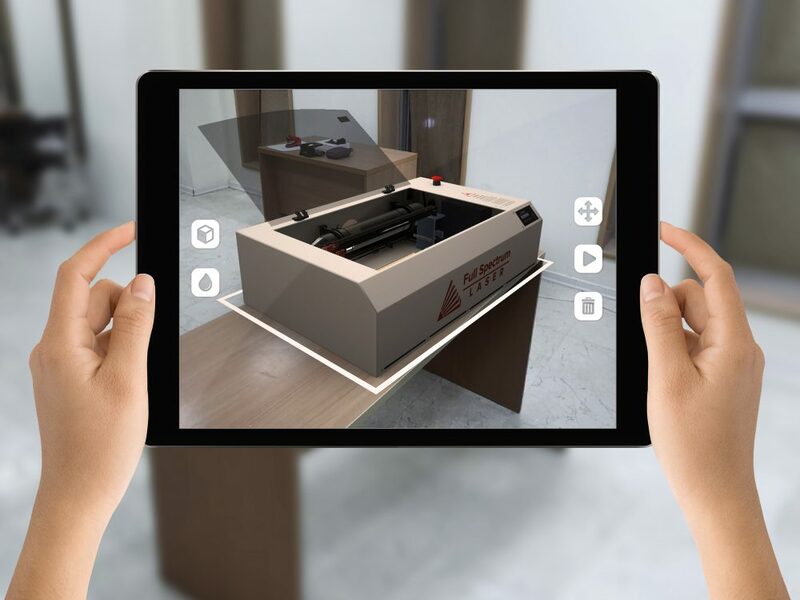 The School Fab Lab Augmented Reality (AR) app displays a set of digital fabrication machines needed to design your Fab Lab Makerspace. With the app, you can envision, design, configure and transform your classroom into a Fab Lab Makerspace using AR before bringing in the machines! This app is available on the App Store for iOS devices. – Take a video walk-through of your space and record the machines in operation. The School Fab Lab Augmented Reality (AR) app is not intended to be a game, rather a simulation, used for education and learning. Our App teaches users about digital fabrication machines, drones and much more. Learn how 3D Printers, Laser Cutters, Vinyl Cutters, and CNC Milling Machines work and fabricate various objects. Inspire your children to become innovators and makers while preparing them for 21st century jobs. For the last four years, we have been working with MIT, NYU and UCLA to develop a Mixed Reality (MR) application to bring digital fabrication laboratories to K-12 education. Our goal is to empower educators with new tools so they can create immersive environments for teaching their students about digital fabrication machines by bringing them into the classroom. School Fab Lab Makerspace is a STEAM, project-based, integrated education program based on the constructionism theory developed by Professor Seymour Papert at MIT Media Lab. It adapts the Fabrication Laboratory (Fab Lab), created by Professor Neil Gershenfeld at MIT’s Center for Bits and Atoms to fit the needs and requirements of schools. We welcome your feedback as we further develop our learning tools.